ottawa baha’i centre official opening | doberman pizza. After a small, but determined religious community in Ottawa raised enough money to buy a former restaurant and renovate it, the Ottawa Baha’i Centre opened its doors yesterday. Baha’i rules don’t allow members to raise funds outside the faith, and that means the 1,000 members from the Ottawa area raised $700,000 through their own donations. […] The new centre, which took 16 months to transform, has a library and bookstore and it will be a meeting place for feasts, or for events with guest speakers. 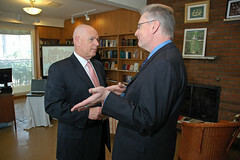 The library and bookstore will be open to the general public, Mr. Smith said. Mayor Larry O’Brien was among the 60 people who turned up for the event. Mr. O’Brien cut the ribbon and offered an inspirational message about faith groups and how much they contribute to the city. MP Mauril Belanger was also on hand to welcome the Baha’is to his riding. The Baha’i choir sang a few songs, and Niels Hansen-Trip, a member of the spiritual assembly, spoke. “The event was well-received and a lot of people talked about the amount of spirit at the occasion,” said Mr. Smith. Update: martinsquest.com featured this story as well; check out his link to the Baha’i Centre renovation pictures. Also, check out Vafa’s Baha’i Centre renovation slideshow (which, coincidentally, played on a continuous loop at the opening ceremony). This entry was posted in baha'i blog and tagged news, photos, video by danger. Bookmark the permalink.